Here are this year’s winners in: Public Service Announcement, Animation, Documentary/Mockumentary and Experimental. Ligiah Villalobos, Trailblazer (Writer/producer – La Misma Luna, Go Diego Go). Betty Kaplan, Career Achievement (Director – One Hot Summer, Doña Barbara, Almost a Woman). Enrique Castillo, Pioneer Award (Weeds, Blood In Blood Out, Mi Familia, Borderline, Teatro Campesino Member). 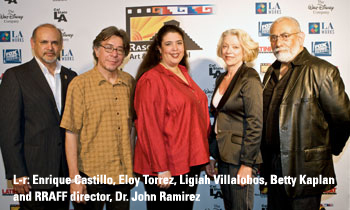 Eloy Torrez, The Vision Award (Featured Artist). Photo: ©2010 Angela María Ortíz S.